Zip Line and Tree top walk above the trees of the beautiful Otway Forest. Enjoy the thrills and adrenalin rush as you fly through the air 30 metres above the ground. This Zip Lining adventure lasts around 3.5 hours and will have you flying through the forest at around 30 metres above the ground. It's guaranteed to get your pulse racing and your adrenalin pumping! With professional guides and safety training, you will be flying on a series of cable spans that are attached to eight different "cloud stations" and two suspension bridges. This is an exciting adventure and this Zip Line tour is like no other in the world. This is the perfect adrenalin rush and thrill seeking ride. You will see the trees and forest ecology and learn to appreciate them in a new light and learn about our growing and vibrant forests. After your zip lining tour you will get to walk on and enjoy the 600 metre Otway Fly Treetop Walk. This is a not to be missed adventure for the whole family. 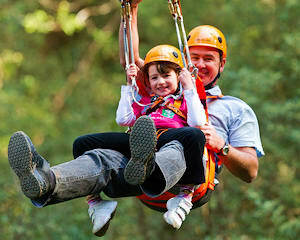 Children between 13-18yrs are able to Zipline without adult supervision, however their waiver MUST be signed by a parent/guardian over the age of 18yrs and the parent/guardian MUST attend the safety briefing and remain onsite for the tour duration. This decision will always be at the Guides discretion. Children between 13-18yrs are unable to be guardians for anyone under 13yrs on tour. Bear in mind that even over the summer months it may be cool up in the tree canopy as you travel from tree to tree - make sure that you are prepared! Tours run 365 days a year from 10:00 AM to 2:00 PM on the hour. Additional tours operate throughout the peak holiday periods and xmas/summer holiday breaks. Please allow around 3-4 hours in total for this adventure. Ziplining at Otway Fly was fantastic. It was better than we expected and Kirsty & Robbie our guides were great and knowledgeable. A lot of fun. Awesome fun. Definitely coming back with husband and son. Thanks to Fi and Beavs, they made it fun, enjoyable and safe! The Otway fly team were absolutely amazing and made the day unforgettable.